NYC Hotel Wedding Photos are always a treat when they are taken at the W Hotels of New York. The very first W Hotels were launched in the iconic city in 1998 with the W New York. The luxury hotel chain now operates 46 hotels in 24 countries and continues to expand. W Hotels now offers five spaces for guests to take advantage of -- four in New York City and one across the Hudson River in Hoboken, New Jersey. NYC Hotel Wedding Photos show all of the moments, both small and grand, that make a wedding day an exceptionally magical event. 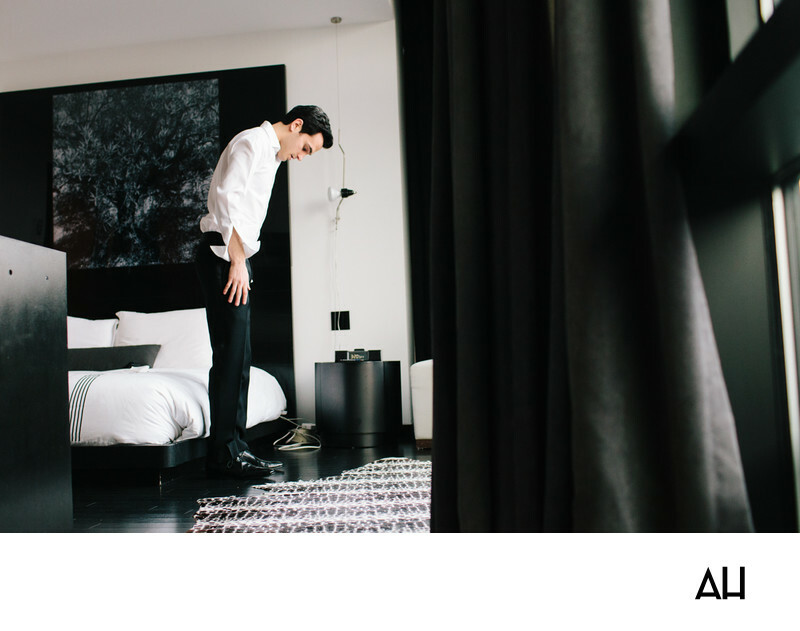 This picture shows a groom in his room at the W New York as he prepares for the special day. The picture is filled with varying shades of black and white, from the decor of the room to the attire of the groom. The scene of the hotel room is very geometrically pleasing to the eye. The floor is made up of jet black wood, offset by white walls. All of the furniture in the room is black, including the low set bed frame. The headboard of the bed is so high that is nearly meets the ceiling, with a tree-like design at its center in hues of gray. The sheets and duvet on the bed are all white, contrasting with the black surrounding it. The groom fits in with this color scheme in his black suit pants, black dress shoes, and pressed white dress shirt. The sleeves of the shirt are still unbuttoned as the groom examines his appearance and contemplates the moments of celebration to come. It is a candid image of a man as he readies himself to meet his bride, the women of his dreams.